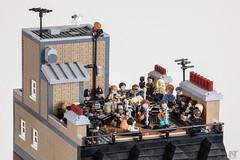 From Britannia Mines blog: What Does LEGO Have to Do with Mining? I missed posting about this earlier, but it’s a great blog entry for our recently closed Britannia Mining Museum. It’s been lifted from their blog which can be found here. What Does Lego Have to do with Mining? 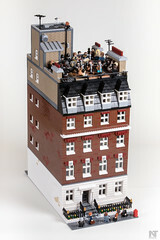 People love Lego – it’s fun, simple, creative, and reminds many of their childhood. I was excited to seeThe History and Future of Mining, a custom-created exhibit by the Vancouver Lego Club come to life at the Museum a week ago and even had a chance to help piece together a couple walls to help with the set up. But why is the Museum displaying an exhibit made out of LEGO? Isn’t it just a toy for kids? 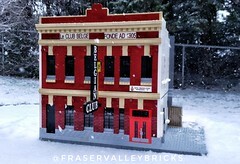 As the adult builders who are part of the Vancouver Lego Club will tell you, Lego is a building material for all ages. It’s a great way to learn the basics of structural engineering, and many teaching institutions use Mindstorms (a kit that enables builders to assemble robots, program with computers, and control them via Bluetooth, apps and even voice command) to teach about robotics and movement. This all sounds great for a science centre, how does it fit with the Britannia Mine Museum? Britannia and Lego share the same spirit of creativity and innovation. Although the principle behind the techniques used in mining and milling have remained more or less the same over decades, Britannia was a place of invention and experimentation. This drive and desire to maximize efficiency pushed Britannia to be a leader with its gravity-fed Mill 3 and use of froth flotation to separate chalcopyrite from waste rock. Lego means “I put together” in Latin. 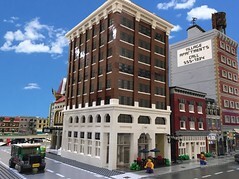 Each brick by itself is just that – a single brick – but the sum of its parts can result in amazing creations like vehicles, cranes, and furniture. The success of Britannia also lay in the sum of its parts as employees and machines worked together to mine and mill raw ore and make the Britannia Mine the largest producer of copper in the British Commonwealth in 1929. For a lot of people, mining may not seem the most accessible subject and the Museum (indeed, ANY museum) is always looking for new ways to capture the imagination and attention of every visitor, no matter their enthusiasm. 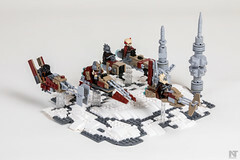 As a visual medium, Lego can make a subject fun and relatable for all ages.The History and Future of Mining display is split into four quadrants that are briefly explained in less than 100 words, but the beauty of the display is that visitors can easily learn the different methods used in each time period by simply examining it – no reading required. 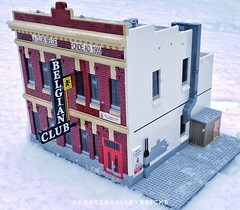 The display extends beyond the table and the Vancouver Lego Club has “hidden” 20 minifigures around the Museum site as an interactive “scavenger hunt”. Visitors are encouraged to find the minifigures and identify them on a ballot sheet for a chance to win a special prize supplied by the VLC. 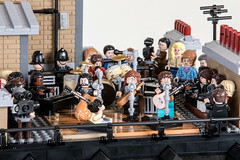 The customizable nature of Lego allows its users to create anything they can imagine and it means that the minifigures often relate to the place they were hidden. Here’s a freebie: a minifigure getting dressed for work is hidden in our Copper Sulphate building where there is a display of miners’ lockers containing clothes and hard hats. While this display may not be 100% true to reality (the presence of an alien and a surfer come to mind) it is enough for visitors to gain a general understanding of the big picture ideas rather than concentrate on the fine details of statistics and fact. At the end of the day, we hope our visitors leave the Museum with good memories, a few new ideas and an inspired interest in our unique subject and Lego is just the perfect click-fit for Britannia. The History & Future of Mining by the Vancouver Lego Club is on display in the Assay until April 6, 2014.